Barmoor Castle had been a stopping point for English armies on their way to Scotland since before the time of Edward II and continued in this role through to 1745 and after. 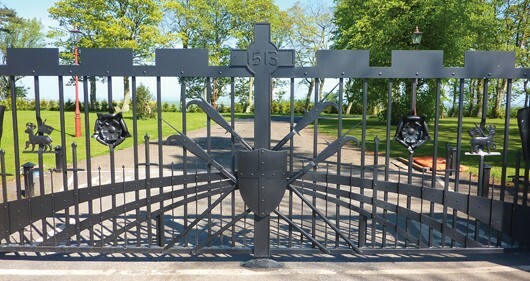 The gates at Barmoor Castle were erected in 2010, to commemorate Barmoor as the site of the English Camp on the night before the Battle of Flodden. 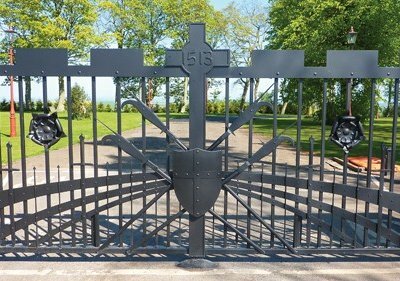 The gates, in bespoke wrought iron, depict the banners of the English Army, the Tudor Rose and the main English weapons of 1513 - the bill, various swords and also the longbow and arrows. Through the mists of time Barmoor, formerly known as Baremoor, has undergone great transformations and played a role in the theatre of English history. In the 7th Century all land stretching from Tyne and Wear was given to the Monks of Lindisfarne. Following the destruction of the Island Monastery and the subsequent resettlement of the Monks at Durham, the land around ‘Baremoor’ was given to Durham Abbey, and tithes were paid accordingly. With the advent of the Normans and the vast land division, Barmoor was bestowed on the Muschampe family with the Barony of Wooler. It is interesting to note that the Muschampe family continued to pay a tithe to the Shrine of St. Cuthbert for the privilege of sepulchre within the walls of the Priory. The fee consisted of a toft (house) and coft in ‘Baremoor’ with four acres of arable land, the village field called ‘Longstrothirside’ and 100 loads of peat to be taken from the peat moss of ‘Kentefeu’. The Muschampe family built a ‘holde’ or tower at Barmoor and a small town soon sprang up around the fortification. The Muschampe family played host to King Edward in 1291 and Edward II in 1319. A licence to crenellate (add battlements and loopholes to) the tower was issued on 17th May, 1341 by Edward III, at Westminster. In 1417, Henry V and his Lord Wardens of the Marches assembled an army of 100,000 men at Barmoor to chastise the Scots for dispersing a body of English near Roxburgh. The Scots who had just crossed the border, retired on hearing of the approach of the formidable army. The Borders were the setting for many skirmishes between Scots and English but none more dramatic than the Battle of Flodden on September 9th, 1513. James IV captured Etal, Ford and Chillingham before taking up position on Flodden Field. Surrey and the English Army encamped the evening before battle at Woodend Wood, and spent the following evening at Barmoor Wood. Barmoor must have reverberated with the joyous celebrations of the victorious English Army. At this time, the holde was large enough to house 30 horsemen. The Border warfare began to take its toll and Barmoor suffered accordingly, until finally in 1541 the building was counted among the fortresses which were destroyed by the Scots, and in a report lodged in Newcastle was described as ‘ruinous and in extreme decay due to lack of repair’. By 1548, the estate could only parade seven able men. Although we have no record of the style of building at Barmoor in the sixteenth century, some alterations and renovations must have taken place. One ‘History of Northumberland’ refers to a chimney front on which M 1584 was cut. When St. George, Norroy King of Arms, held his visitation of Northumberland in 1615, he, or his Deputy, found preserved in the Charter Chest of George Muschampe of Barmoor, a number of early fourteenth century charters, abstracts of which are preserved in the Harlequin Manuscripts in the British Museum. Although the Union of Crowns took place in 1603, the border was still a hazardous place to live. The turbulent years had drastic results on the Muschampe fortunes and finally on 23rd February 1649, Lady Muschampe renounced administration in favour of her husband’s creditors. Watts and Blackborrow, the London creditors, later obtained possession and Barmoor was conveyed in 1661 to William Carr Esq. of Gray’s Inn. At the same time his father, Robert Carr of Etal, was given power of attorney to receive rents. The initials of William and Margaret Carr with the year 1681 were cut on a stone let into the front tower, it was removed in 1801. Margaret Carr survived her husband and died childless. Her will dated 9th July, 1702 seems to have given the property to her kinsman Lord Falmouth, who had dealings with it in 1712. It was later sold circa 1720 to Martin Bladen of the Parish of St. Ann’s, Westminster. Later still, Barmoor was acquired by Samuel Phipps of Lincoln’s Inn, Barrister-at-Law. He died in 1791 and, being the last survivor of his family, he gave Barmoor, with considerable other property, to his second cousin Francis Sitwell. Francis had assumed this surname in 1776, in lieu of his paternal name of Hurt, on succeeding to the property of his maternal uncle, William Sitwell. Francis gave Barmoor to his second son, Francis, in 1793, who finding the old mansion house of the Muschampes and Carrs to be unsuitable as a residence, set about a total transformation. The Architect John Patterson of Edinburgh, who trained under Adam, was employed and the designs he produced – a mixture of revival and Regency – both remind us of the Border conflict and yet introduced Barmoor into a new era of social elegance and stability. In the return of ‘Owners of Land’ in 1873, published by order of the House of Commons, it is stated that Mr Francis Sitwell was proprietor of 3,766 acres in Northumberland of the yearly rental income of £2,855. The Castle must certainly have been the centrepiece of a thriving estate! The Sitwells enjoyed just less than 200 years of rural life at Barmoor and during that time the family had a distinguished record in the civil and military services. Another chapter is about to be written in the history of Barmoor as plans to renovate the castle are currently being implemented. Gates can be viewed 24 hours, 365 days. Access to Barmoor Country Park is between 10am to 5pm every day except Christmas Day. Visitors are welcome to drive down the main drive to view the exterior of the castle and the site of the English Camp. To view the gates pull through the gates and park on the drive beyond. No coaches. From Wooler - take the B6525 north to Doddington and continue for a further 4 miles until you reach the B6353, signposted to Ford and Etal. Turn left and follow the road for 900m. Barmoor Castle gates are on your right. From Berwick - take the A1 south for 3 miles, then turn right onto the B6525 signposted to Wooler. Follow the road south west, past Oxford Farm and Ancroft, for 5 miles. Pass the Lowick and Barmoor war memorial and continue for a further 900m before turning right onto the B6353 signposted to Ford and Etal. Turn right and follow the road for 900m. Barmoor Castle gates are on your right.